A hydroelectric dam in the southern part of Laos collapsed in the evening of 23 July. 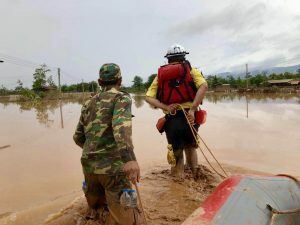 The Laos government reported that the dam in Attapeu province collapsed as a result of heavy seasonal rainfalls. The break has caused widespread flooding, destroyed crops, and created a need for food, water, and temporary shelter. BGR International is working with a local partner on the ground assessing the needs. We will respond with local volunteers and resources to this catastrophe after the assessment is complete. Current reports have the homeless toll at over 6,000. The government issued a call for aid in the form of clothing, food, drinking water, and other items. The dam was an economic initiative meant to sell electricity to surrounding countries. BGR International (BGRI) is a registered Singapore Charity. We work as a Non Governmental Organization to meet human needs around the world. Designed by SBA Mobile Solutions LLP. Your donations make the world a better place. Let’s make a difference. Donate now via Giving.Sg or direct bank transfer.